I have owned a laptop approximately since 12 years. It was around the time when Facebook was gaining popularity in India. And since then it has been a part of my routine. I know many people are against Digital world and social media, But i absolutely adore this world of mine. I feel I have a big, beautiful family inside my Laptop as well. So following the thrill of LoL-A-Thon organised by ‘The Momsteins’. Join us to read some wonderful letters written by 26 cool bloggers. Stay around to read some amazing letters coming up. So today’s prompt came in as “Write a letter to an inanimate object.”so if i can talk my heart out to someone, that my Laptop.My Best Buddy. Now that we have been in a relationship for last 12 years, even though you changed few bodies.. but the soul remained the way I needed. Its time I tell you all I feel for you. After all “feelings” hardly have any say if not expressed right. First of all Thanks to you for always always being there as a partner. You are the one who knows anything and everything of my life. The Diary entries I wrote on you, the Old friends I met through you on FB n ORKUT, the Dates I fixed on Chats, the breakups I encountered, the opportunities an congratulations followed on mails.- Everything came to me through you. Thanks to you for staying awake with me, all night long. My Insomnia turned into a productive practice because of u. I can’t thank you enough for helping me constantly with blogs, google and everything. Though you did hospitalised couple of times and i was dead scared to loose all my interactions with you and I couldn’t think of loosing you too. Well! you fought till your last breath and came back to me for the love we share. You have been perfect company, with no judgements, no Chik Chik and above all just the one to listen. What else can a woman ask for..!! I love you so so very much and I am happy I could write this today. I would like to thank Nisha Zaheer for introducing me. You can read her post here . 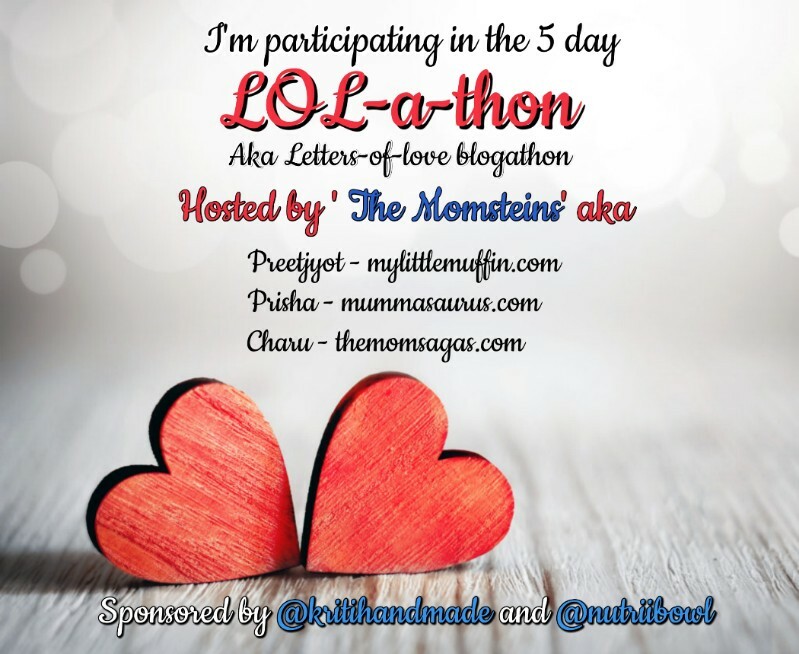 I’m thrilled to be participating in a five day ‘LOL-a-thon’ organised by ‘The Momsteins’. Join us to read some wonderful letters written by 26 cool bloggers. Stay around to read some amazing letters coming up. It was a little early you planned to move ahead, we were still not prepared and needed your Aura around us. There has not been a single day when I don’t miss you at least once. The presence you held in our lives was such that till date we can not accept that you are not around. I wish I told you before that how much I loved you. I wish I could tell you how I learnt to be so kind from you. I was not a bad person but You taught me how to be so considerate even to the strangers. You taught me that No problem is so big that it can not be solved with Love, Compassion and Determination. You only made me realise, how strongly will power works when it comes to defeat any obstacle. Be it your health, emotions or social pressures- everything can be solved if your heart decides so. I could never deal with relations so selfless until I learnt that from you. How could you store and then shower so much love all around you. There has never been anyone who affected my life, my mind and my soul so deep. Even though we had so much of age difference but the way you saw today, I could never see. I miss you a lot, and so does almost everyone in family. We know wherever you are, you are watching over us. I can’t even begin to thank you for all that you taught me, All the love you gave me, friendship you kept with me. The way you shaped me into the person that I am today. How much you have changed my life. And Thats how you will always always remain with me, alive in my heart and smiling as ever. Delhi.. The place where my heart still beats better. Having the whole family settled there already, once a month was a normal frequency to visit Delhi and every time I ll be equally excited, to see my cousins and to explore some more places there. But 15 years back when I Shifted there for my higher studies, I was too over confident as I was quite known in my small town school. That confidence was out of being ace in lot of extra curricular activities and an above average student in studies. So the first day when i entered college and heard all the introductions, I understood that I stood nowhere, every single person there was much ahead of me. At once all that confidence was shattered and low self esteem started taking over. But then right people around made it the other way. In a while I made my place in that big city too. I must say I still had my best time there, my best learnings there and met the best people there. My first real life learnings started there, Real life challenges came there. I started looking at things in a way much ahead of my small town. Well.! Being mother of girls is a totally different ball game. It brings an extra set of responsibility, especially when the daughters are born in a country like ours where even till today females are thought of to be less than males in so many things. The fight of equality is constant, whether it be workplace or home. But I think if we as mothers take the responsibility up & raise our kids to believe that everyone is equal & deserves equal, although it might take one generation more to bring about the mindset change that we want to bring in, but the change is possible. Thus I, as a mother promise myself to instill some values & ideals in my daughters that will help them realize & understand the value of their freedom being born into a free country. So, here are few things I want to teach my daughters Meher & Myrah to learn the true meaning & importance of freedom. No matter what age, everyone should have the liberty to choose what they want to wear, whether it be grown-ups or kids. The narcissist that I am, I have always chosen my own cloths, accessories & looks. Although I have been doing the same for my daughters as they are too young to choose on their own, but if they decide to wear a certain dress or go by a certain look, I respect that & let them make their choices. This will definitely teach them to be comfortable in their own skin. Thus I decide to give them the freedom to choose their own cloths & looks. I cannot imagine living a life where I am not allowed to speak what I wish to. The same applies to kids as well. Sometimes we try to stop kids from saying things because it is not that cute or might look like our kids are not disciplined enough. But I believe in letting kids be kids & speak what they wish to. This is the only way – by doing mistakes – that they will learn the value of speaking the right thing in future. This doesn’t mean that I do not talk to them later if they end up saying something which they shouldn’t at their age. I would love for my daughters to be super models or divas when they grow up. Well, but what I wish for them should not define what they should become. If I go by what my parents wished for me, today I might not have been a successful entrepreneur that I am. I would teach my daughters to work towards their dreams & be whatever they want to be, no matter how unconventional the path they choose is. One thing we all need to learn even as grown-ups is to handle rejection. But when we feel rejected, we feel resentment, hatred, anger & sometimes even suicidal. Why? Because we have not been taught since our childhood that it’s OK to be rejected. One rejection whether it be in love or a job interview is not end of the world. I would love for my daughters to be able to gracefully accept rejections, work on themselves to be able to not rejected in future & move on from the situations. That’s freedom from our own demons, isn’t it? This does not apply only to professional freedom but also in personal life. If my daughter decided to be a housewife. It is going to be her personal choice. If she decided to be a non-religious person, it is going to be her freedom of choice. I hope by being a kind of mother that I wish to be, I will be able to teach my daughters the importance of freedom the way I want! This blog post is a part of #LetsDiscussFreedom Blogathon. I would like to thank Archana from The Indian Prenting Blog for introducing me, she wrote an amazing read on the same prompt. I would now like to introduce Pradanya from Mummying Aint Easy and recommend you to read her views on the same.